TOI Flush allows luxury in a confined space. Many well-thought out details such as automatic flush or the visual cover ensures for the feeling of well-being. It offers innovative highlights that cannot find anywhere else. 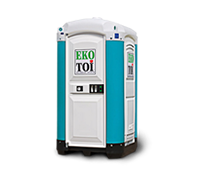 We were the first to introduce the a mobile toilet with an automatic flushing system, which ensures cleanliness after each use. A further plus point is the visual cover that prevents the stomach-churning look into the tank. Add to this the comfortable wash basins with soap dispensers and the paper towel holder. Well-kitted is TOI Flush.